Race plays an important part in SMR. There are advantages and disadvantages to each of the eight races. 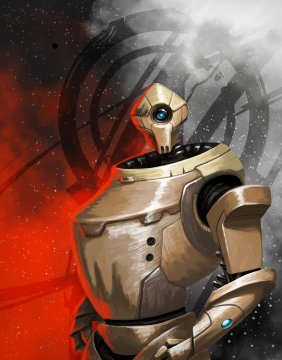 In the following sections, you will get a brief overview of each race and information on their special technology, if they have one, as well as their ships and weapons. This race of tall, thin humanoids have just recently (in the last 100 years) developed the technology that allows inter-stellar travel. However, in the last 100 years, their friendly nature has allowed them to trade for much of the technology the other races had achieved. They do not focus on combat, but they have been preparing themselves in case it arrives. Their ships tend to be geared more towards commerce than combat, and this matches their enterprising nature. They continue to seek the knowledge of the other races, and to explore to the edges of space. They tend to have relatively good relationships with most of the other races. Alskant start with +250 relations with all races. The Creonti are an introverted race that has little to do with the other races, except for trade which has become vital to all of the races. Their small stature also has led them to feel inferior to some of the other races. However, these feelings are easily overcome with the weapons they usually carry. They have moderately good to neutral relationships with the other races, but most of them live by a Creonti First motto. They are very team oriented, and unite quickly to defend their own. While they do not start conflicts often, they have been involved in several and are viewed as proficient pilots. All Creonti ships can support a scanner, except for the Medium Cargo Hulk. No other technology can be mounted. These humanoids tend to be the first to jump into the different wars that develop. They are often the first to take sides when a conflict ignites, even if it does not affect them directly. They were the original founders of several attempts to unify the races, all of which failed. However, they are the most courageous (and outspoken) of the races. They tend to roam the entire galaxy, and team up with various traders of many races if it suits their goals. They also have the broadest knowledge of the universe as a whole, due to their extensive exploration and the fact that they were the second race to develop the technology for interstellar travel. Their relationships with other races tend to vary a lot. The only relationship with any level of consistency is their irritation with the West-Quadrant Humans, a division of their race that broke away over 300 years ago. Humans have the special technology of the jump drive. This allows a ship to jump from one sector to another without having to pass through all the sectors in between. The Humans are one of the best utility races in the universe. The Border Cruiser can quickly deploy a minefield to deter the curious, and the Destroyer can stock planets with both goods and combat drones. This makes players of the Human race vital for any alliance that plans to control planet galaxies. 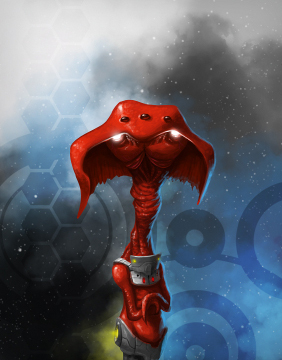 Considering the average Ik&apos;Thorne stands about 11 feet tall, it is no surprise that they are the designers and builders of the large cruisers throughout the galaxy. While there are several other models available, the Ik&apos;Thorne line of battle cruisers and carriers are commonly regarded as the strongest of the ships. However, their weapons are not exceedingly strong, and they usually are forced to go to others to equip the ship with weapons and combat drones. The Ik&apos;Thorne like stability. They don&apos;t care as much if they are at war with someone or at peace, but just like things to be consistent. Races who are constantly changing their views on things annoy them. This is probably due to their extremely long life spans. While they have butted heads with the Thevians and the Salvene over the centuries, they maintain no outstanding "enemies." However, their empire is often attacked and plundered for its wealth and knowledge, so they are drawn into many conflicts. 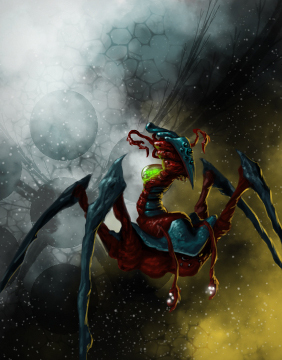 The specialty of the Ik&apos;Thorne race is the use of combat drones. 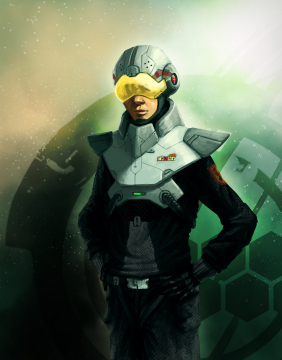 Instead of depending upon a lot of armor to protect their ships, they rely instead on large quantity of combat drones to protect their ships in case of an attack. The Nijarin are a race of six-limbed reptilian creatures. The Nijarin race has existed just as long if not longer than the other races but has only just recently come out of hiding. 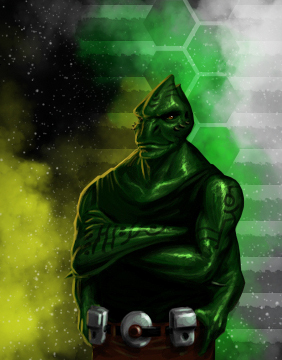 The Nijarin have become very powerful contenders in the war for resources even though they only recently resurfaced. Their focus is on offensive power which has caused the creation of high-HP ships and very powerful weaponry. This has caused the reduction of shields and armour to allow their ships to support such a heavy payload. To make up for this the Nijarin use a technology called the Drone Communications Scrambler. This device causes enemy drones to be much less effective. The Nijarin fleet cannot be held back from taking back their part of this universe of war. Nijarin ships were added to the game after the original seven races. Heavy firepower and reduced damage taken from combat drones, at the expense of defenses. This race of quadripeds has a strong focus on conquest. They are not concerned with honor and justice and other such "trivialities", but rather they focus on the wealth, power, and extent of their own empire. They tend to alter their relations with the other races to whatever suits them best at a given time. While they are very trusting and dependent on those of their own race, relationships with others are slow to form, and they distrust most of the other races. While they are involved in a lot of trading, they put a large focus on combat. It is rare that they are not at war with somebody. While their ships are decent trade ships, they excel in combat situations. The Salvene race thrives on deception. Because of their small stature, the Salvene have developed the technology of Illusion Generators. These generators allow them to mask the appearance of their ships. All of their ships that cost credits can support an illusion generator. They can pose as a helpless escape pod, a massive warbird, or anything in between. This forces players to carefully consider the true strength of a Salvene opponent before beginning a fight. However, a decent scanner is able to see through the illusion. The strong focus on reputation is what distinguishes Thevian culture from most of the other races. This race lives its entire life inside of a robotic shell. They use the shell for all movement and interaction. This shell is shaped like a humanoid, but the Thevians themselves are quite indescribable. Their desire for reputation is what causes them to be extremists. 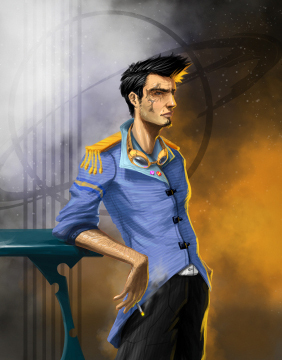 The good Thevians will be extremely good, hunting down evil throughout the galaxy, even if no formal bounty is set. If there is a bounty on a person, they view it as an even better chance to make a name for themselves. The evil Thevians take the exact opposite route, becoming the most notorious criminals in the galaxy for their acts of destruction and cruelty. They wander around raiding ports and planets and destroying all they encounter. Thus, their need to distinguish themselves leads them to contributing to most admirable police/bounty hunters and the most notorious criminals. The Thevian ignore most of the current technology and focus on mainly speed. They make sure that their ships are the fastest in the universe, capable of running circles around the hunters and war ships of the other races. 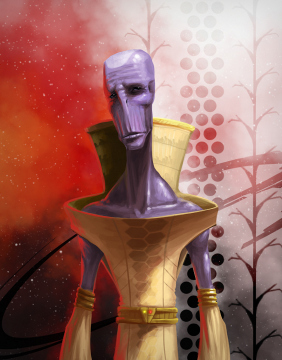 When it comes to zipping around the galaxy early on, the Thevian are the best. While they are of the same race as the Humans, the WQ Humans want nothing to do with them. When the Humans were attempting to unite the races, the WQ Humans began colonizing the Western Quadrant of the galaxy. Here they developed their communities and began extensive trading with other races, specifically the Thevians. The unification attempt failed due to a war that broke out between the Thevians and the Ik&apos;Thorne. The main Human forces almost immediately joined forces with the Ik&apos;Thorne, for several reasons that are not clearly understood. The WQ Humans looked upon this as being unjust, and lobbied several times to withdraw Human involvement from the conflict. Finally, they declared themselves a separate entity. 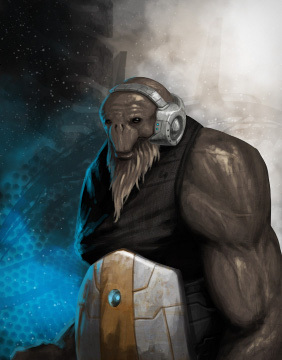 Immediately, the Humans withdrew from the Thevian-Ik&apos;Thorne conflict, and attempted to suppress the rebellion. The civil war continued for over 50 years, and ended in an unstable peace treaty. Since then there have been several conflicts between the two human groups, and their relations seem to be worsening. Because of the worsening relations, the WQ Humans have developed cloaking technology for their top ships. This allows them to move about space and hunt or trade without detection. However, the cloak technology has one exploitable flaw. If a cloaked ship comes in contact with a space mine, the cloak switches itself off and must be manually reset, leaving the ship vulnerable to attack.